Hello! Yes, I am alive! Apologies for the extended hiatus, I took some time in between jobs and am now settling into my new one. I've been quite busy and also kind of avoiding technology when I can, since I had been on the computer a lot at my old job, and also on the computer for most of the day at my new/current job. I hope to get back into my groove soon, I have some ideas for posts that have been brewing for a few weeks now. Since my new job is back to my roots, so to speak (I'm a therapist again, woooo! ), I definitely think Wellness Wednesdays will start to gain momentum again! I'm also open, as always, to any ideas and suggestions from my readers. Before I end this post, let me share a quick recipe. The past few weeks my diet has been, well, pretty poor. Ugly poor? Whatever, either way, it has not been the healthiest. I'm planning to do a bit of a cleanse soon, a riff off of that cleanse I did back in July. With the holidays coming up I want to continue on the healthy path versus cave in to sugar and dairy - that fleeting pleasure one gets after consuming those foods just isn't worth it anymore, with all of the side effects it comes along with. So that recipe...Last night, after a not so successful day of eating healthy (I had the day off and no lie, I watched 10 episodes of The Originals), I made a delicious simple spiralized dinner: one zucchini (spiralized on blade C), leftover roasted shiitake mushrooms, lacinato kale, quartered kalamata olives, sauteed that up gently over medium-high heat, in EVOO, for about 3 minutes or so, and then tossed it with a tahini vinaigrette that I made using tahini, apple cider vinegar, turmeric, ground ginger, one garlic clove minced, some water, s&p. I also topped the dish off with some nooch. It's dishes like this that make me think, why don't I cook more often?! It took less than 10 minutes total to prepare the dish! 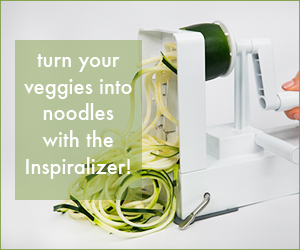 Spiralizing, man, it's amazing. Anyway, looking forward to talking soon! Looking forward to new posts. Always informative and interesting.